Japan's prime minister has called the decision by a Chinese frigate to put a radar lock on a Japanese navy ship a "dangerous act". Shinzo Abe told parliament the move could have led to an "unpredictable situation" and called for Chinese "self-restraint". The incident happened near disputed East China Sea islands last week. 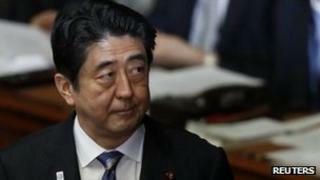 The Chinese foreign ministry said it was not aware of the details, but said Japan should stop "illegal" activities. "In recent days, Japan has on many occasions deployed aircraft and ships and illegally entered Chinese waters around the Diaoyu Islands," spokeswoman Hua Chunying said. "China has made representations on many occasions and requested Japan stop its illegal activities." The US has voiced concern over the incident, which comes with ties between Beijing and Tokyo severely strained. The radar equipment is used to pinpoint the location of a target for missiles. Once the radar is locked on, weapons can be fired immediately. Mr Abe called on China to avoid an "unnecessary escalation" in the territorial row, which centres on a chain of islands that both claim. "At a time when it seemed there are signs of improvement towards increasing talks between Japan and China, having this sort of one-sided provocative action taken by the Chinese is extremely regrettable," he said. "[China's action against the Japanese vessel] may be a sign that China has been increasingly frustrated with the Abe government's unyielding attitude. In particular, China distrusts Tokyo for its failure to take concrete action to improve its relations with Beijing even though Abe underscored the importance of bilateral ties in a letter sent to Xi." "[The Japanese allegation] is entirely a self-directed and self-acted farce. The motive behind the farce is to heat up the controversy over the Diaoyu disputes, and warm up for Abe's upcoming visit to the US." "With the imminent visit to the US by Shinzo Abe, Japan must keep hyping up threats from China to strengthen its alliance with the US." Japan controls the islands, which it calls the Senkaku islands, while China calls them the Diaoyu islands. Taiwan also claims the island chain, known as Diaoyutai in Taipei. The row over their ownership has rumbled on for years but reignited in September 2012 when the Japanese government purchased three of them from their private Japanese owner. Since then, Chinese government vessels have been sailing in and out of what Japan says are its territorial waters, prompting warnings from Tokyo and raising concerns over a clash. On Tuesday, Japanese Defence Minister Itsunori Onodera said a Chinese navy frigate had locked its weapon-targeting radar on a Japanese navy ship on 30 January, prompting Tokyo to protest to Beijing. He said a Japanese military helicopter was also targeted with a similar type of radar by another Chinese frigate on 19 January. "Directing such radar is very abnormal. We recognise it would create a very dangerous situation if a single mis-step occurred," he said. The US warned that the row threatened regional stability. "With regard to the reports of this particular lock-on incident, actions such as this escalate tensions and increase the risk of an incident or a miscalculation, and they could undermine peace, stability and economic growth in this vital region," said US state department spokeswoman Victoria Nuland .